Why is there something rather than nothing? Where did the 400 billion or so galaxies come from, exactly? That's the question posed and answered by theoretical physicist Lawrence Krauss in A Universe from Nothing. In fact Nothing is Something and Nothing is Unstable. From the beginning of our universe to its end, this book is sure to delight. Richard Dawkins is a Fellow of the Royal Society and was the inaugural holder of the Charles Simonyi Chair of Public Understanding of Science at Oxford University. He is the acclaimed author of many books including The Selfish Gene, Climbing Mount Improbable, Unweaving the Rainbow, The Ancestor’s Tale, The God Delusion, and The Greatest Show on Earth. Visit him at RichardDawkins.net. "Astronomers at the beginning of the twentieth century were wondering whether there was anything beyond our Milky Way Galaxy. As Lawrence Krauss lucidly explains, astronomers living two trillion years from now, will perhaps be pondering precisely the same question! Beautifully navigating through deep intellectual waters, Krauss presents the most recent ideas on the nature of our cosmos, and of our place within it. A fascinating read." "In this clear and crisply written book, Lawrence Krauss outlines the compelling evidence that our complex cosmos has evolved from a hot, dense state and how this progress has emboldened theorists to develop fascinating speculations about how things really began." "With characteristic wit, eloquence and clarity Lawrence Krauss gives a wonderfully illuminating account of how science deals with one of the biggest questions of all: how the universe's existence could arise from nothing. It is a question that philosophy and theology get themselves into muddle over, but that science can offer real answers to, as Krauss's lucid explanation shows. Here is the triumph of physics over metaphysics, reason and enquiry over obfuscation and myth, made plain for all to see: Krauss gives us a treat as well as an education in fascinating style." "We have been living through a revolution in cosmology as wondrous as that initiated by Copernicus. Here is the essential, engrossing and brilliant guide." "In A Universe From Nothing, Lawrence Krauss, celebrated physicist, speaker and author, tackles all that plus a whole lot else. 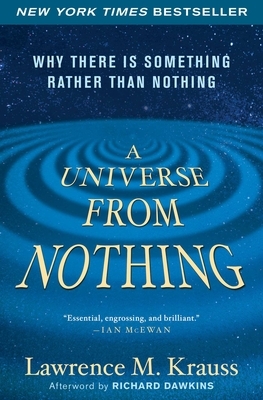 In fewer than 200 pages, he delivers a spirited, fast-paced romp through modern cosmology and its strong underpinnings in astronomical observations and particle physics theory.Krauss’s slim volume is bolder in its premise and more ambitious in its scope than most. He makes a persuasive case that the ultimate question of cosmic origin – how something, namely the universe, could arise from nothing – belongs in the realm of science rather than theology or philosophy." "His arguments for the birth of the universe out of nothingness from a physical, rather than theological, beginning not only are logical but celebrate the wonder of our natural universe. Recommended." "With its mind-bending mechanics, Krauss argues, our universe may indeed have appeared from nowhere, rather than at the hands of a divine creator. There's some intellectual heavy lifting here—Einstein is the main character, after all—but the concepts are articulated clearly, and the thrill of discovery is contagious. 'We are like the early terrestrial mapmakers,' Krauss writes, puzzling out what was once solely the province of our imaginations." "The author delivers plenty of jolts in this enthusiastic and lucid but demanding overview of the universe, which includes plenty of mysteries—but its origin isn’t among them. A thoughtful, challenging book." "People always say you can't get something from nothing. Thankfully, Lawrence Krauss didn't listen. In fact, something big happens to you during this book about cosmic nothing, and before you can help it, your mind will be expanding as rapidly as the early universe." "A very interesting read from a foremost physicist of our time."